A Couple of Drowned Rats. HotloadeD > Competitions > A Couple of Drowned Rats. Hurrah for yet another big shooting weekend! I think at least three of the four seasons made an appearance with rain, sun, wind and *shock, horror! * dead calm. We thoroughly enjoyed the NZ Ladies longs (800, 900 and 1000 yards – organised by the ladies!) and had a soggy old time in the Karori 1000 yards competition. I entered C grade (my actual NRA grade) and Jared decided to put his shooting to the test and jump up to B grade and take on an extra challenge. We are still sharing a barreled action between our two stocks so had to plan our day to accommodate this. The forecast for the weekend was to steadily get worse with strong winds appearing Saturday afternoon and rain to join the wind on Sunday. Despite the impending weather, Saturday started out warm, calm and somewhat dry, yippee! I have discovered that porridge is easy to make by pouring boiling water over oats and milk powder (no cooking required!) so I was in charge of a nutritious, delicious shooting-breakfast while Jared had prioritised a different activity… COFFEE! Satiated and slightly buzzing, we gathered together our gear and headed to the range. On arrival, despite being as unladylike as you can possibly get, I grabbed an armful of wind flags and headed off with the other ladies to assist with dressing the range. Putting out wind flags is one of my favourite jobs before shooting. I enjoy the walk, and the exercise relaxes me. Jared hung out at the clubhouse and got the rifle ready to shoot. By the time we pulled up to the 800 yard mound, the flags were still hanging limply against the poles. Throngs of shooters were scrambling to get their names in the first detail to beat the imminent gale and more than a couple of people were taking photographs of the unusual view! We managed to get squadded fairly high up the order but we needn’t have worried. The conditions remained almost perfect throughout the shoot and there were some very good scores. Jared shot a 50.4 which he was very pleased with. This was his first 50 of the year and hopefully there are many more! Unfortunately it still wasn’t enough to be in the top three of his grade for this range. As I said, some very good scores! My score wasn’t quite as impressive. My first sighter was low in the four ring so I adjusted off it. My next sighter was a high 3 so I decided to split the difference and ended up with a high 4 as my first counting shot – bad start! I brought my elevation down a bit more and from then on, I was shooting 5s with the occasional V and an X! I rushed one shot which I was punished for (another 4), and the wind started to build on my last shot and I was blown out to the right. I ended up with a 47.3 which I was initially unhappy with because it was one of the lowest scores on the range. In hindsight, I only had one actual bad shot. Wind and the bad decision to adjust of my first sighter counted for the other two 4’s. I should know not to do that by now! I got down to get ready next to Smudge, and it all made perfect sense. The wind was tricky but nothing I didn’t feel comfortable with. You could see the changes and I was quite happy to say “Here comes another 50!”. When Smudge had finished, I got ready, looked up, and had that lovely sinking feeling that I’m sure we all know too well. So I got on with it and immediately got a 2! Hmmm… Why was I not shooting 5 minutes ago when I could do this? Well… I bumbled around and just could not beat the wind shifts so kept getting spanked by the wind and got a 43.2. Bugger. That was me out of contention for the trophies… Or was it? If I shot a 50 at 1000, I could still take it out! Now I was more determined! Glad to see it was not just me! The wind had turned to the right. From then on, the Vs and Xs were flowing! I dropped another point somewhere along the line but I finished on a high. I shot a 47.5 in not the easiest of wind conditions. Not bad! After lunch, we moved back to 1000 yards for the first time this season! By this time, the wind had become quite a lot stronger – not the gale force that we were promised but instead, a deceptive lazy fishtail – not unlike the tail of a trout as it basks in the sun. Despite the languid appearance of the flags, the angle was slippery and ambiguous. Deciding between left and right was half the battle and by the time you have figured it out, it may or not have changed. Jared either had a better handle on the wind than me or he had a good patch. He was doing very well with 4s and 5s and then the target comes up blank… a miss! The shot turned up as a 5 on the neighbouring target. Bugger. Jared ended up with a 41.2. If that 5 had been on his own target, he would have had a 46.2 which would have been one of the better scores on the range. I really struggled and ended up with a 34. I had a couple of 5s and a couple of 2s and some 3s and 4s. All in all, my shots were all over the place. I can mostly put it down to wind but there was a little bit of up and down that I can’t explain. Pretty disappointing after two good shoots in the morning but I suppose it happens. We also entered the pairs match which was shot last thing in the afternoon. The match was shot at 1000 yards and we were shooting Bisley-Style (which means team members shoot on the same target but alternate shots with a strict time limit for each shot). There was a grand total of two teams entered in the shoot. It is easy to understand the low numbers – long day, savage wind, getting dark etc… I reluctantly shot my own rifle for this as it would be impossible to share (The last time it is shot before a new barrel) and scrambled around setting it up in the short amount of time before the match. It was good fun! I continued to be knocked around by the wind and unfortunately had a bit of an inconsistent waterline. I felt quite pressured having only one minute for each shot but at the same time It helped some of my indecisiveness! It was starting to get quite dark towards the end of the shoot which I don’t think was really affecting me and when we finished, it was noted that we had about 30 seconds to get back to the clubhouse before the sky opened and we got drenched! I beat my earlier 1000 yards score by a couple of points and got 36.1. Jared did not have a very good shoot at all and got a 33. We ended up second out of the two teams which isn’t very surprising considering our score! In the end, I came 3rd in C grade for 800 yards, I won 900 yards and didn’t place in 1000 yards. I was 3rd overall in the C grade aggregate and won a prize for it! A lens-cleaning pen sponsored by Gun City Wellington… It is pretty cool and will be very useful. Thanks Gun City! Jared didn’t place in B grade although he would have come 2nd if he hadn’t shot on the wrong target! The day was rounded off with an awesome quiz night fundraising for some of our buddies to go to the World Champs next year. A drizzly grey Sunday morning tapped on the window and pulled funny faces at us until Jared got fed up with the racket and pushed me out of bed to make coffee. We were both feeling a little groggy after a substantial Saturday but coffee seemed to help a little bit. I didn’t feel much like porridge so made couscous with Parmesan cheese (another “pour boiling water on top” type dish!) which helped a lot! The greyness persisted while we were preparing for our first shoot. I hid in the car out of the steamy wetness and sorted out my sights. I have a set of rear sights for each of our rifles and I swap my peep between the two as necessary. It is a quite a delicate job and I always manage to get fingerprints on my lenses and filters which are hard to clean out of the corners… Enter my new lens cleaning pen! After a minute or so, all my glass is crystal clear. I am pretty sure this pen has just changed my life. I think it will be good for the camera lens as well! There really is not much to say about my shoot – Tired, grumpy and ill-prepared, I got down with a sight picture that didn’t work for me and got bludgeoned around the target by the weather and my own frustration. In the end, I was just fireing shots to get the suffering over with. I got off the mound with a 36.1 and a much shrunken ego. I was grouping well, but once again, my wind-picking let me down. I shot a 33.1, releasing my last shot just as I ran out of time and also just as it started to properly rain! I am slowly getting a system together to keep my ammo and sights dry in the rain. I like the idea of having a towel on the mound to dry my hands on and cover my ammo with, but previously have had no luck in preventing it from blowing away in the blustery Wellington wind. I had a small revelation in this shoot… Bulldog clips to secure the towel to my mat… Yippee! Rain-related problem #1 sorted! Due to the rain, it was decided that the second match would be 7 shots only. This was mainly because the targets were starting to get soggy in the rain and maybe a little bit because we were getting behind on time. It was still only raining moderately while Jared was shooting. He was shooting very well, 4s and 5s mostly but unfortunately he also threw a shot low and got a miss. Jared ended up with a 21 out of a possible 35. I sauntered onto the mound and set up camp in the dry Jared-shaped silhouette on the mat. While swapping stocks and sights over, I discovered rain-related problem #2… keeping my sights dry! I found a solution to this problem quite quickly. I keep my sights in a little drawstring bag to protect them – I just leave this bag on while I set up and get into position. Once the sights are safely sheltered under the umbrella of my hat, I can whip off the bag and shoot. The shoot itself was along the same vein as my other 1000 yard shoots. I was getting a lot more comfortable with my sight picture but properly struggling with the wind as the flags were sodden, heavy, sluggish, and hard to read. I even scored a 1! Halfway through the shoot, it started raining cats, dogs, and most noticeable of all, torrents and torrents of water. Before long, I was inundated and seriously considering a snorkel for my rifle. Despite aiming at a grey blur through another grey blur, I finished the shoot happy. I know I need to get better at picking wind but despite the rain I was shooting a very tight waterline. I also love shooting in the rain. My tactic is to wear quick drying minimalistic clothes (board shorts and sandals) and just allow myself to get wet on the basis that skin dries very quickly. It is comfortable and seems to work. Oh… and my ammo and sights stayed bone-dry in the downpour… Win! Unfortunately, the adverse weather showed no signs of abating and the last shoot was called off due to disintegrating targets so we squelched our way back to the clubrooms. Jared had already dried himself off and cooked me a toasted sandwich and a cup of tea (tea cooked in Vic-Style) … What a legend! I came third in C grade and I won a cool patch. Results here. 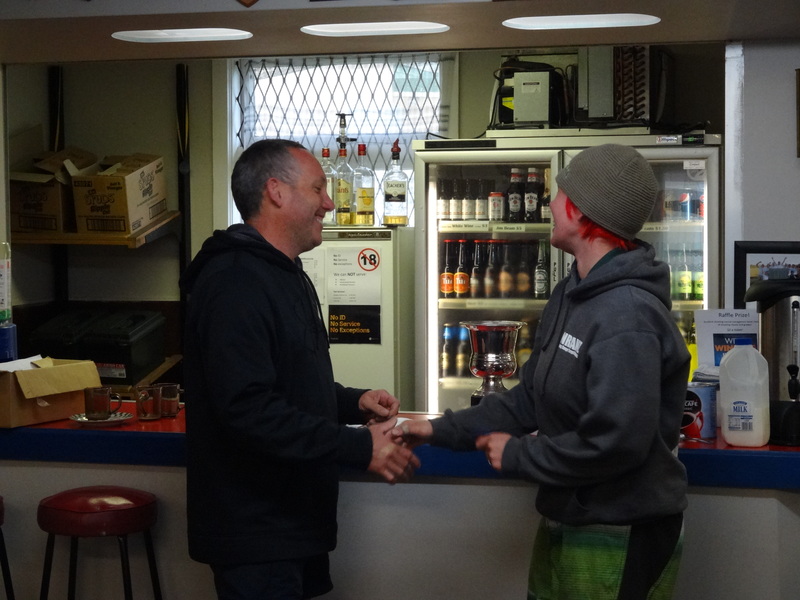 Photo from Karori Rifle Club – Click on the photo to see more photos on Karori Club website! All in all, a great weekend with lots of practice at the longer ranges, problem solving, shooting in the rain, shooting Bisley-style and keeping fed and watered during a long day. Thanks to Karori Club and the NRA Ladies for organising two very fun events. Also to the sponsors for their awesome prizes! I now seem to be coming down with some sort of snotty lurgy thing which I think I will blame on the possibly pathogen-infested atmosphere of the crowded quiz night rather than shooting in the rain on Sunday. I’m sure that I will be better in time for shooting on Saturday! My rifle is off being re-barreled and we both sorted out a lot of little problems before nationals!